The Cure Medical Closed System Intermittent Catheters are DEHP and latex free. 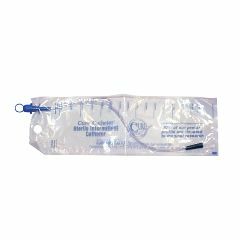 These sterile, single use, unisex systems feature polished eyelets on a straight, pre-lubricated catheter tip with integrated 1500 ml collection bag. Closed System singles are available by the box (100 units/box). 100% DEHP Free products, as a known carcinogen, DEHP should not be in medical devices. At Craig Rehab in Denver they found that I.C. users were 100 times more likely to develop bladder cancer. People with a higher risk of cancers should avoid carcinogens. 100% fire polished eyelets on all products, all the time. I wouldn’t use a product with cold punched eyelets, so we won’t manufacturer them. Cure Medical gives 10% back to find a cure; it is time for manufacturers to step up. There are many ideas to find a cure, but without funding, nothing will ever happen. Lightweight. Easy Storage. Safe. uti events way way down. when used as directed uti events almost disappear. Have had seams not sealed. I had my paraplegic husband use these while hospitalized for 2 weeks with a broken leg. No UTI's and could use by himself easily. We use while traveling or at appointments. He has had problems with the seam and leakage. We have used Bard with no problems but are more expensive. Emergency. and every day use. i used this on a trip and they were very convenient. What is the volume of the bag containing the catheter and ultimately, the urine that flows into it? I use these catheters on my husband because he doesn't have the dexterity in his hands to do it himself. I have learned that you have to keep the bag in a vertical position as much as possible or urine can leak out around the top where the catheter goes into the bag. The seal is not liquid proof and I too found that out the hard way. As long you keep the bag at least angling downward when you advance the catheter, you should avoid have a leaky mess. I hope that makes sense and is helpful. CURE ARE THE BEST CATHATERS MADE. THE ONLY COMPLAINT IS THAT IT IS HARD TO SEAL THE CAP BACK ON. OTHERWISE THGEY ARE TERRIFIC..